I never thought I'd say this but I may be suffering from a slight cookie overdose. I know, I know, it's basically blasphemy. But somewhere in between the Biscoff Oatmeal Cookies, the Blogger Cookie Swap, and the cookies that keep magically appearing in lunchroom at work, I think I may have developed some cookie fatigue. Yesterday, someone asked me if I wanted a cookie and I paused to consider it. I PAUSED. That has never happened. My normal reaction is somewhat akin to that of Cookie Monster where I shove the cookie in my mouth, crumbs flying everywhere, before the person has even finished asking the question. Lest you think my cookie fatigue has resulted in a desire to eat salads, fear not food friends! A few nights ago, I had a serious hankering for Panda Express but was too lazy to change out of my pajama pants (which may or may not have green frogs dancing the Macarena) to actually get my faux Chinese food on. And so I began searching on the holy grail that is Pinterest. As a side note, how are people pinning thousands of things ranging from cute outfits to DIY projects to delicious recipes? Are they pinning in the shower? While driving? While pondering people's pinning prowess, I ran into a delicious looking picture... with a broken link. Womp Womp. The picture and name, Bang Bang Chicken, were good enough to get me a' Googlin'. Holy heck, there are a LOT of versions of Bang Bang Chicken. I'm sure some are more authentic than others but authenticity takes a back seat when a woman's got a craving for Panda Express. So I continued perusing recipes. Peanut Sauce? Sure. Soy and sesame oil? Okay. But my personal favorite? Crispy chicken bits drenched in a sweet and spicy mayo sauce. It was oddly (and deliciously) reminiscent of Honey Walnut Shrimp, sans the candied walnuts. And as dinnertime approached, I bravely exclaimed, "Challenge accepted!" I fried up some chicken and cooked up some veggies. I know, I know. 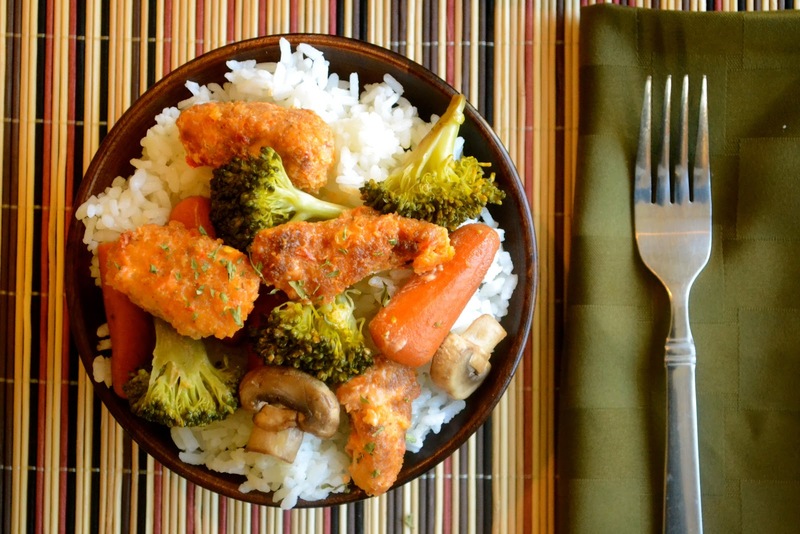 Bang Bang Chicken (or even Honey Walnut Shrimp, for that matter) is not supposed to have veggies. 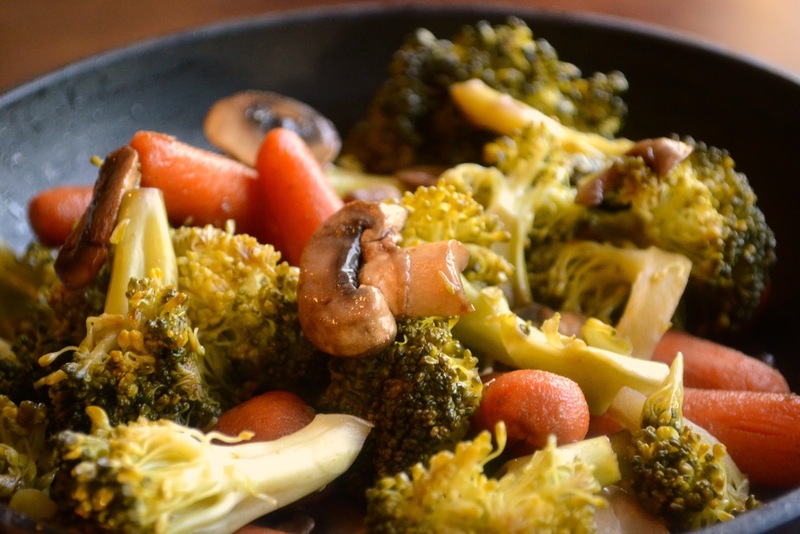 But I'm still feeling a bit of cookie guilt (as is my waistline) so I threw in some veggies to balance out all the sugar and butter I've eaten in the last few weeks. The result? A perfectly comforting bowl of Chinese-takeout'esque food. All in the comfort of my frog branded pajamas. Heat a thin layer of oil in a small frying pan (you can deep fry the chicken bits but I found pan frying worked equally well). Combine the milk and egg in a bowl. Combine the flour, panko, salt, pepper, and garlic powder in a separate bowl. Bread the chicken cubes by dunking a few of them in the breading mixture, then the egg mixture, then back in the breading mixture. Continue until all chicken cubes are breaded. Fry chicken cubs in oil until golden. 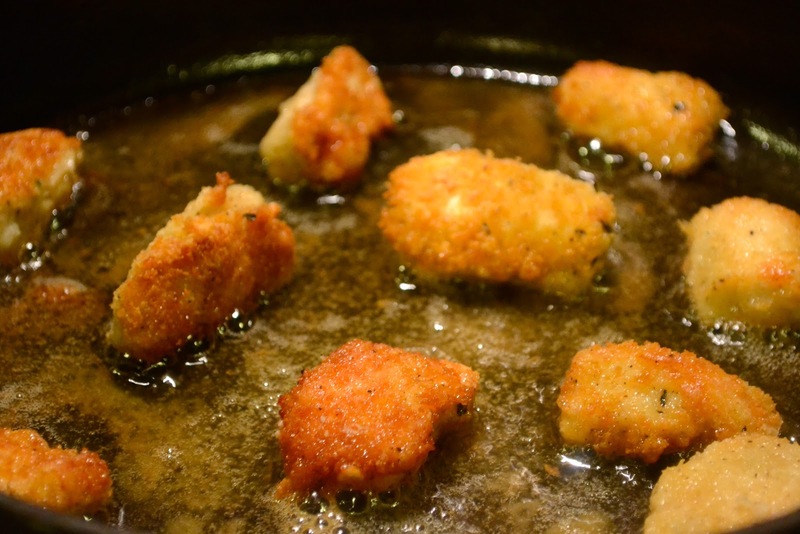 While chicken cubes are frying, mix the mayo, chili garlic sauce, sugar, and rice vinegar in a separate bowl. Adjust seasoning to taste (I've also made this substituting honey instead of sugar and it's been great). Dump all of the fried chicken cubes in the sauce mixture and mix until the chicken cubes are coated. Serve over steamed rice and veggies. Or not. I found the chicken was pretty fantastic on its own and ate many (many!) pieces while preparing my "real" chicken, rice, and veggies bowl. Recipe adapted from A Table for Two Blog. Love the name of this dish! And I laughed out loud at 'cookie fatigue'! Haha! This sounds just fantastic. I'm crazy partial to Rooster's Sambal Oelek too. LOL, pinning in the shower! Actually, not too far fetched...ever see the Seinfeld episode with Kramer making salad in the shower? Anyway, I am starting to feel the cookie fatigue too and have also moved on to fried foods (working on a post right now, in fact). But it needs a snazzier name, like Bang Bang Chicken. This looks like it would really hit the spot right now. I need to develop cookie fatigue...I've never been stricken with this particular ailment and it's beginning to show. Happy New Year! I hope that the three of you are doing something fabulous to kick 2013 off! I barely have cookie love, so there's no fatigue to be had, but that doesn't stop me from drooling over this chicken dish even though it's just barely 9am. I love bang bang shrimp, so it's safe to assume that I'll love this too. It looks fantastic. Dudette has froggie pajamas, you know I don't think they're doing the macarana though. I've never had this chicken, but the honey walnut shrimp (or Crispy Orchid Shrimp, as my fav rest. calls it), is a much loved-treat. Happy New Years!!!! Cookie fatigue, never, lol. I know I will probably be detoxing on salads for weeks, lol. I need to spend more time on Pinterest, I would love bang bang chicken. Hope you and the family have the best New Year ever. I'm sure by February though the cookie cravings will return. This looks amazing... never had bang bang chicken, and I'm usually reluctant about eating Chinese outside for the amount of sodium. I've never really made Chinese chicken at home, you inspire me! Happy New Year!